Today I want to begin adding my big washes. 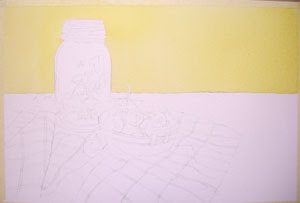 I like to start with my largest washes, and I often start with the first glaze of a background wash. 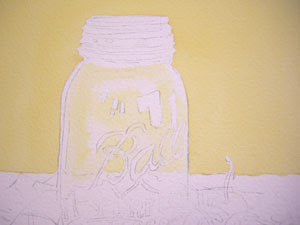 I used a large, wet puddle of Aureolin Yellow and New Gamboge to wash onto the background. I keep the board tipped, stroke each area only once and allow gravity and water to make the pigment flow. If you use a very light touch on the paper, only using the brush to direct the puddle, your paper will not be disturbed and your washes will be clean and bright. I also added some of this mixture to the areas in the jar where I can see the background showing through.